We are predicting at least one movie from 2000 to the present that will endure 30-40+ years into the future, much like CASABLANCA or GONE WITH THE WIND have done today. Bonus predictions could be who will be hosting on this channel and how will movies be delivered to the consumer (hologram, chip in the brain, etc.). 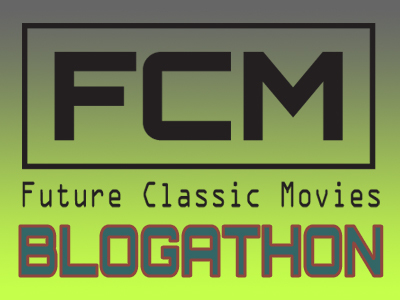 Be sure to check out all of the other films being considered at the host page for the blogathon HERE. The setting: 3 days in Los Angeles, California. The cast: Don Cheadle, Larenz Tate, Sandra Bullock, Terrence Howard, Thandie Newton, Ryan Phillippe, Michael Peña, Brendan Fraser, Chris “Ludacris” Bridges, Matt Dillon, Tony Danza, and many, many, more. This film shares the intertwined stories of people caught in the general hustle and bustle of life who are numb to the needs, similarities, and concerns of those around them. Sometimes “we crash….just so we can feel something.” Crash, at first glance, looks to be a film that tackles the subject of racism in today’s society (“Everyone’s a victim, and everyone’s guilty”), but it covers so much more. 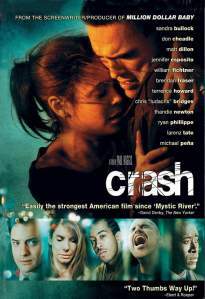 Very few people expected Crash to win the Academy Award for Best Motion Picture during the 78th Academy Award Ceremony when it was announced to be in contention with the likes of Capote, Munich, Good Night and Good Luck, and Brokeback Mountain, but it did. (Watch Jack Nicholson announce the winner HERE). This story of tolerance and love resonates to so many human beings on so many levels as it seeks to inspire change and truth in the hearts of the viewers. This drama does not hold back when it comes to the individuals’ stories: their subject and their portrayal. Tons of emotionally gripping scenes which deal with everyday issues in life. Those “everyday issues” enable Crash to stand the test of time as the subject remains relevant and attention-grabbing continually. It is nigh impossible to tear your eyes away from any and every scene in this film. Possibly controversial and definitely disconcerting at times, it covers subjects ranging from racism and stereotypes to family and humanity as one. As the trailer states, it is a film about people and the unknown/unrecognized internal and personal longing for connections with your fellow man. It also shows the ignorance shared in regards to one another and how we should all seek to overcome it for the betterment of us all. The stories of several people in Los Angeles, intricately, ingeniously, and unexpectedly interwoven, convey the need for humanity to progress and coexist. We all are human with similar cares, concerns, ambitions, and desires. Regardless of background, everyone has a story. 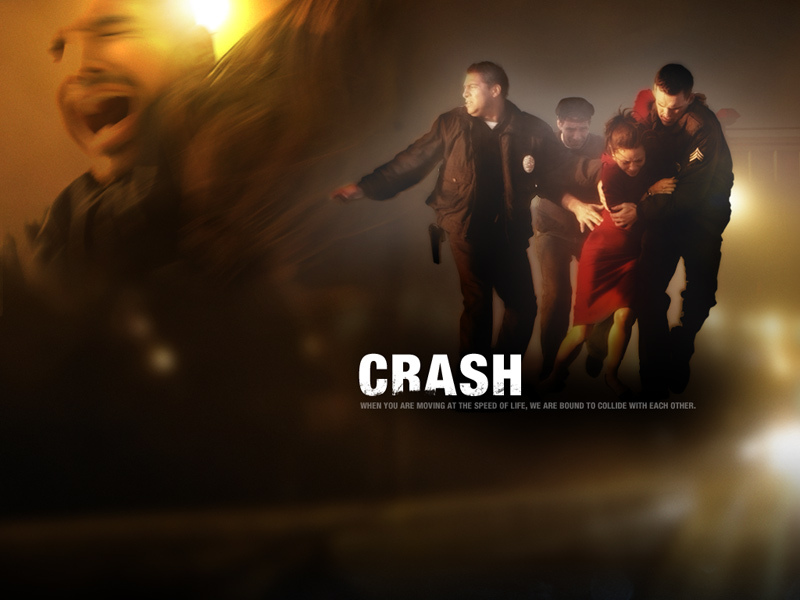 Crash melds them all together in L.A. in such a unique and powerful manner that is not to be missed. A film that definitively seeks to prompt change on such an enormous scale is imperative for humanity to remember and cherish. 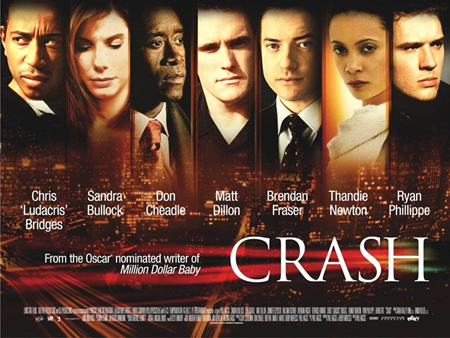 Standing the test of time with a solid/believable plot, a valued or enjoyable message, an Academy Award, a fantastic cast, and memorable/gripping performances are all marks of Crash, which, in my opinion, usher it into the coffers of cinematic classics in the future. If you haven’t seen it, do so quickly. This is the first time I read about the movie itself and not its “defeating” Brokeback Mountain, so thanks for highlighting a movie I don’t think I’d have been wanting to watch otherwise! Thank you for taking the time to read. I am glad that my post made you more interested to see it. Thank you very much. Well done, T. This is not an easy film to nominate. It is all that you say, and continues to touch upon things many still do not want to think about (as a native Angeleno, I know of what I speak). I think the reverberations of CRASH, its affect on viewers, what it says about us and our reactions to it, are still out there. Well done, my friend. Thanks for this. Agreed…it is not easy, but it is, shall we say, necessary. It’d be nice if, in 30-40 years, this film is only necessary as a reminder of how we used to but don’t want to be. I truly appreciate your kind words here. Paula, Thank YOU for putting this together and allowing me to be a part. It’s okay that you haven’t seen CRASH yet. That means you get to enjoy it soon for the first time. A classic to be sure! I remember seeing the trailer, but I never got around to seeing it. You give little away about what actually happens – how these characters crash into each other. And this has actually made me interested in seeing it. Excellent review! Thank you for your kind words. Appreciate it. You captured the full intent of this post…to encourage people to see it without telling what it is all about. WHEN you see it, and you think about it, I will be interested in your thoughts. I saw this in the theater and thought it was an interesting look at race relations in modern America. 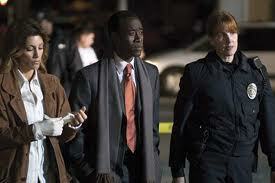 I was really taken with Sandra Bullock’s performance. Also featured a good turn by one Larenz Tate, who does not get the love that he should. Solid actor. Yes. Sandra Bullock was quite amazing in the role, wasn’t she? And, good point on Larenz. I wish he got more parts. Thank you for commenting on this post today. Bravo for picking such a polarizing film. I know that my friend Ted hates this film with a vengeance but I appreciate it, it’s an intriguing look on race relations and it doesn’t seem *preachy* to me. I thought the storyline of Thandie Newman & Matt Dillon is the most memorable as it’s quite shocking when I saw it and I remember really loathing Dillon’s character. I can’t imagine if I were in Thandie’s situation, oh boy! Anyway, great writeup! I seem to remember Ted loathing Crash. Thanks for commenting and reading Ruth. Yes, Thandie and Matt’s interaction was unnerving to say the very least. Thanks for your comments on our site. Boy, there are a lot of people who don’t like this movie, aren’t there? I loved it when I saw it in the theater, for many of the reasons you stated. I think it definitely still holds up! And thank you. You’re right. There are several who don’t like this movie. But I was pleased when it won. It def left an impact on me. TL;DR: I loathe this film. Thanks for the comment here Max. I definitely knew that this would be a polarizing choice. I like it for stated reasons, but can definitely understand not liking it for what you mentioned. I, of course, saw it differently and saw it deserving! I appreciate you chiming in. I wonder, if the other BP nominees hadn’t have been options, what do you think would’ve competed with CRASH and possibly beaten it for BP? I remember loving this film when I saw it in the theater, but then the worst possible thing happened…it won Best Picture. I even resented it a bit, as I am a huge fan of Good Night and Good Luck and also loved Brokeback Mountain. Alot of hate is out there for this movie but I remember watching it in the theater and being moved to tears more than once. I have to watch it again to re-evaluate. Thanks for the write-up! Hi Christoper. Thank you for stopping in and commenting. I knew a lot of people who felt the same as you when it won BP. But, I am glad that this was a movie that still remains in your memory. Appreciate ya stopping by and writing some input!